MOSCOW – Ancient ethnic strife, fanned by East-West rivalry and Moscow’s growing regional ambitions, lie behind the war over Georgia’s breakaway regions of South Ossetia and Abkhazia, where Russian troops opened a second front Monday.For dozens of young Ossetian men lined up at a Russian Army recruitment center in the North Ossetian capital of Vladikavkaz, the conflict is a replay of endless clashes with their traditional foe: Georgia. For Georgians, whose forces are retrenching after failing to retake the separatist province of South Ossetia, the war appears just the latest futile effort to unite their country against what they see as Moscow’s neocolonial designs. US and Russian diplomats, who sparred angrily over the crisis at a United Nations session Sunday, were falling back into the language and passions of their long, bitter cold-war standoff. The war, which began with a lightning Georgian offensive Friday aimed at ending secessionist South Ossetia’s 16-year-old de facto independence, prompted a Russian military intervention which, by Monday, had put Russian forces in full control of the region. The West worries that Moscow’s true goal is to subjugate pro-West Georgia and overthrow its democratically elected president, Mr. Saakashvili. In a Wall Street Journal opinion piece on Monday, Saakashvili warned that if Moscow’s drive succeeds, Western influence in the region will be defunct. Hours after President Dmitri Medvedev asserted Monday that Russia’s limited “peace mission” in South Ossetia was nearly over, Russian troops rolled into Georgia proper. The move into the western town of Senaki, which lies well over Georgia’s buffer zone with Abkhazia, opened a second front in the conflict. At press time, Russia had also moved into the Georgian town of Gori, just outside South Ossetia. Russian experts say that Moscow seeks to blunt US influence in the region and halt the eastward expansion of NATO into the former Soviet Union. Beyond that, it is likely to become the main arbiter of disputes in its area, including Georgia. “Russia is moving toward an analagous role [vis-à-vis South Ossetia] to that which the US plays when it, for example, guarantees the security of Taiwan against attack by mainland China,” says Vladimir Zharikhin, deputy director of the official Institute of Commonwealth of Independent States Studies in Moscow. “But this situation is beginning to look too much like a direct clash between Russia and the US,” which has strongly taken Georgia’s side, he adds. Whatever the outcome, the conflict has already inflamed old hatreds and its consequences seem likely to reverberate destructively around the entire multinational Caucasus region, which was conquered by Russia in the 19th century and later divvied into ethnically defined cantons by Soviet social engineers. The Ossetians, who claim to have inhabited the same territory for centuries, say their nation was broken in two by Soviet dictator Joseph Stalin, who awarded South Ossetia to the Georgian Soviet republic against the Ossetians’ will. (Stalin also took away Abkhazia’s independence and made it an autonomous republic within Georgia.) As the USSR was collapsing, Ossetians fought a brutal war of independence against Georgia, which ended in a three-way peacekeeping agreement in 1992. 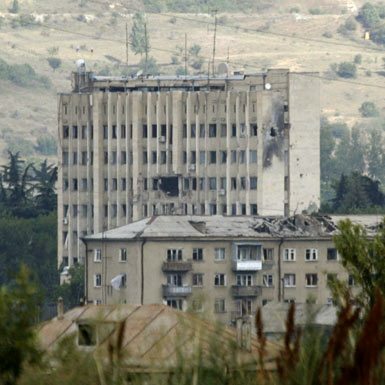 Under that deal, Russian, Georgian, and South Ossetian forces were to jointly guarantee security until a final settlement was reached.The arrangement collapsed in a hail of artillery fire and bombs last Friday. Many Georgians argue there that South Ossetia is actually the ancient Georgian territory of Samochablo, given by the Soviets to Ossetian settlers for aiding the Bolsheviks in crushing Georgian independence in the 1920s. They point out that Georgia, which emerged as a sovereign state from the ruins of the USSR in 1991, enjoys full rights to the territory under international law. Georgia has offered limited autonomy to South Ossetia and Abkhazia, but both have declined. In 2006, South Ossetians voted overwhemingly for independence in a referendum, which Georgia denounced as illegal. Russia has accused Georgia of committing “genocide” in its assault on the rebel republic, which they say killed at least 2,000 civilians and displaced 34,000. Western human rights monitors caution that it’s too early to make any judgments about what happened. But Lev Ponomaryov, head of the Moscow-based Movement for Human Rights, says he hopes the West will hold Saakashvili’s feet to the fire on this issue. Paul Rimple and John Wendle contributed reporting from Tbilisi, Georgia; and Vladikavkaz, North Ossetia.